I’m keeping it real and sharing things that I’m TRULY THANKFUL for…but probably won't share at the dinner table. When I open up the washer or dryer fully expecting to find it full of clothes and it’s EMPTY! When I’m in a hurry and EVERY SINGLE LIGHT IS GREEN! People with COMMON FREAKIN’ SENSE. When I have a free day to BINGE WATCH WHATEVER THE HELL I WANT! That one second at the end of the day when no one is asking me for something. 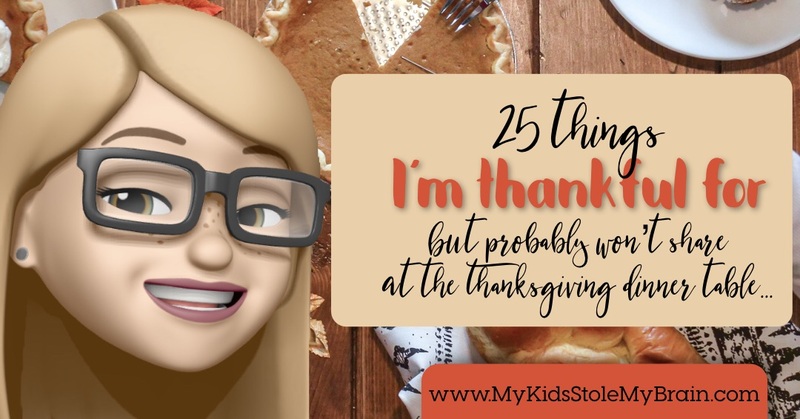 And last, but certainly not least, of course I’m thankful for all of you for supporting my silly little blog and taking the time to read it and let me know that you have read it and that you enjoy it…even if you are just being nice!